What do we do at ARdictive? We create and produce augmented reality experiences that make understanding and memorising complex matter easier. Our experiences engage with our senses by combining visual elements, interaction, fun and storytelling. Our augmented experiences are targeted towards touristic experiences, brand communication, education and businesses. Let us take one example in the field of tourism. The idea of creating augmented experiences to make understanding and memorising of complex content easier was inspired 16 years ago by a friend who is researcher in the field of augmented reality. This dear friend showed me the great work done by the research team he was part of. They used augmented reality technology to create an augmentation of the historical site ruins of Pompeii. Their project enabled the visitor to see more than only the remaining ruins of Pompeii. The research team had augmented the real ruins by virtually adding the missing walls and ancient life that the viewer could see appear through a head mounted display. This enabled the viewer to not only imagine a past world in abstract terms, but to see and experience how it was. This is what inspired us this following illustration that shows one of the application of augmented stories for tourist visits. 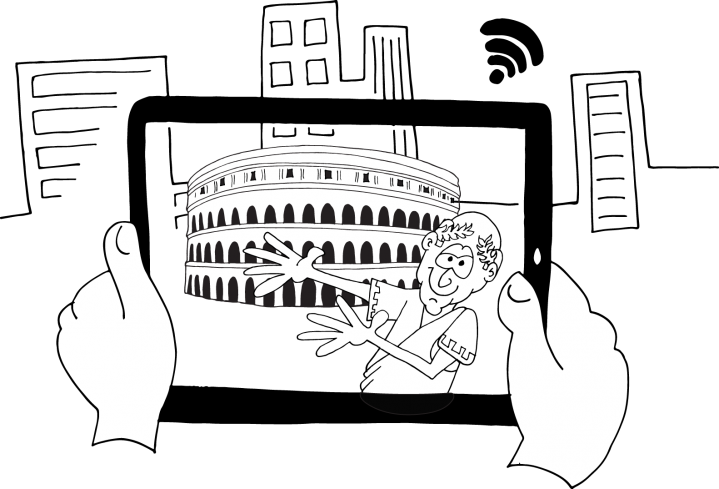 Here we see a virtual Cesar inviting you to visit the virtually reconstructed Coliseum.